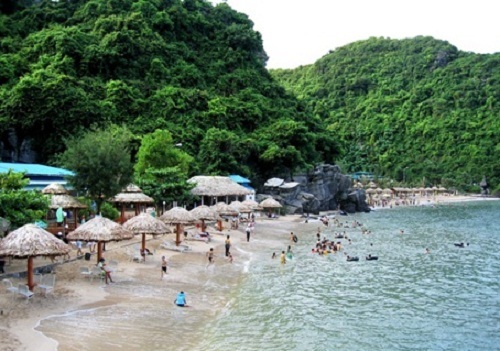 Cat Ba Archipelago is one of the most famous tourist destinations in Hai Phong, Viet Nam. 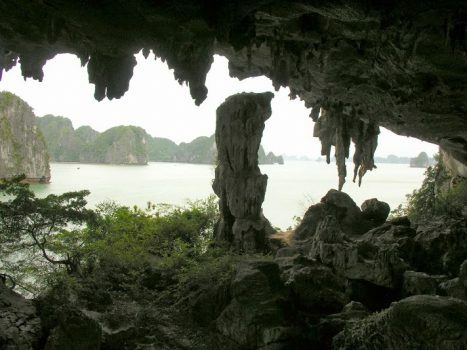 When travelling here, tourists should not neglect Monkey Island belonging Lan Ha Bay in Cat Ba Archipelago. Tourist coming to Monkey Island will be attracted by funny monkeys, natural beauty of beaches and interesting activities. Monkey Island is a small island located 2km from Cat Ba town. From Cat Ba town, you have to take a taxi or motorbike to Beo harbour where you go by boat to Monkey Island. 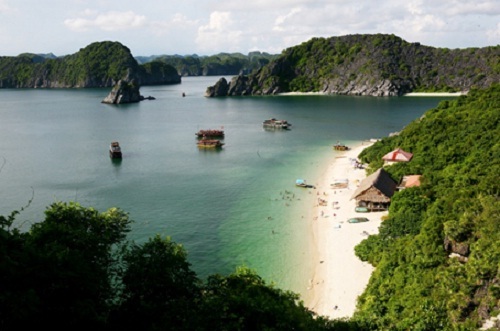 It takes you about 15 minutes, through the floating village and many beautiful islets in Lan Ha Bay. Previously, Monkey Island was known as Cat Dua Island (“Dua” means “Pineapple”) because this island has many wild pineapple fruits. Local people often soak these fruits to drink or desiccate them to make diabetes medicine. 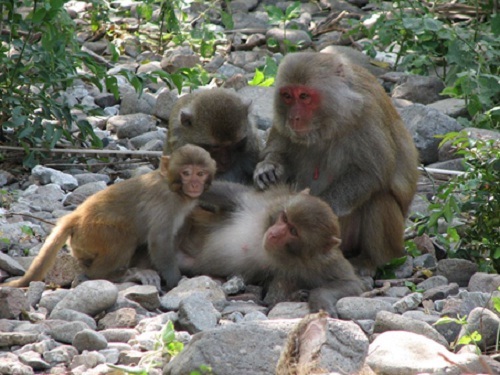 Nowadays, the island is often called Monkey Island because it has about 20 monkeys. Most of them are castled there by the forest-man, and quite bold to human. Visitors are free to take pictures and have fun with the monkeys while the monkeys often eat food like banana, apple, etc. from tourists. Funny monkeys impress everyone who has been here, especially children. 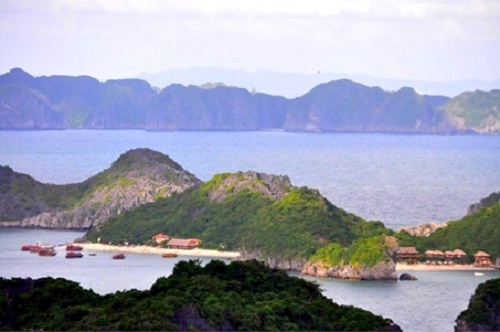 Visiting Monkey Island, many tourists prefer to climb up to the mountain top for panoramic view of Lan Ha Bay with hundreds of small islets. Besides, with clear blue water and fresh air, Monkey Island beach is also the most beautiful satellite beach of Cat Ba Archipelago. In front of the beach, the undulating mountains create extremely unique view. In summer, when beaches become crowded, Monkey Island beach is still uncrowned and absolutely suitable for people who want to avoid the noisy crowd. 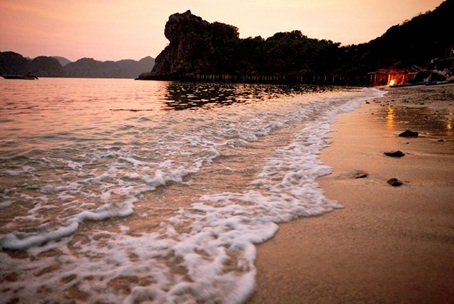 After swimming, when relaxing on sandy seashores, you will feel all the beauty of the sea, especially at sunset. 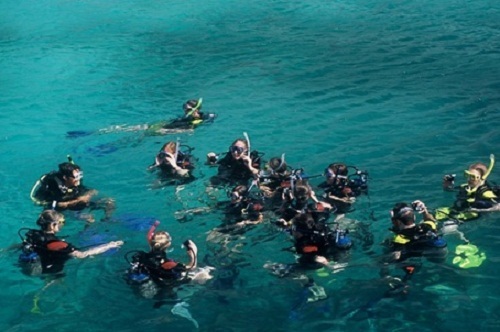 Monkey Island is also an ideal place for many activities like play football, volleyball on beach, kayaking around the island or scuba diving into the sea. 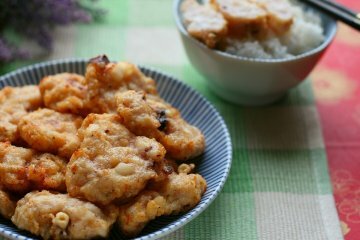 In Monkey Island, there is Monkey Island Resort with traditional house. 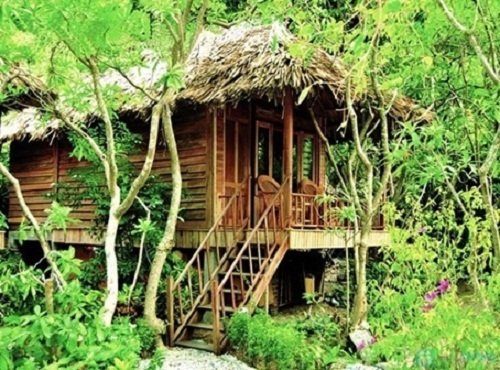 Monkey Island Resort has more than 20 bamboo cabins fully equipped. You will have a great time enjoying the fresh air of the ocean when staying here. There is also a smaller beach called Cat Dua 2 mainly for tourists in the resort. Monkey Island Resort in particular, Monkey Island in general is the best place for tourists who want to have a quiet and romance space. 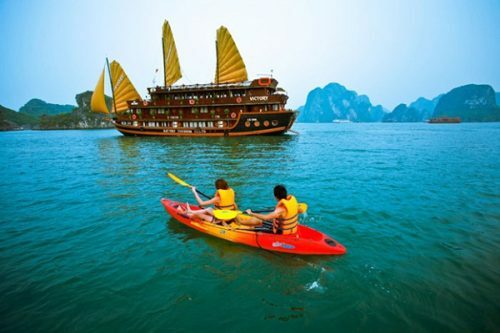 You can spend an overnight hotel stop on a Halong Bay tours run by travel agents from Hanoi or online agents and then one day on Cat Cat and Monkey Islands.